Taken from the word ‘Innovation’, Innova is the home of new, unique, exciting patient care equipment. Every day, we work with end users, carers, healthcare professionals, architects, designers, and care institutions to make sure that we’re always evolving and adapting to the needs of the healthcare sector. We guarantee excellent comfort and support by making sure that our products are the most straightforward, multi-functional, user-friendly models available. We aim to challenge the way that things are being done, and we will do this by designing and developing new, revolutionary products that will change the way that people think about care equipment. We combine aesthetics and functionality to deliver consistently high quality, dynamic goods. And if we’ve enhanced quality of life along the way, we know we’ve achieved our goals. Innova has focussed on the needs and desires of end users, carers, healthcare professionals, architects, designers, and care institutions. We’ve done an awful lot of thinking and have spent many happy hours at the drawing board. As a result, every single product in our range has got something unique about it, something revolutionary. Merging quality, innovation, and aesthetics is our speciality. My first impression of Innova was one of professionalism and a great understanding of End of Life care. From trialling beds, mattresses and rise recline chairs to purchasing and customer care, they are always on hand to give advice and information. They took the time to talk to our clinical staff to really understand our requirements. Not once did we feel pressured into purchasing. We have since purchased beds, mattresses and rise recline chairs and have been extremely pleased with the fluidity and professionalism of the service. The Percy Hedley Foundation engaged Innova to develop an innovative and fit for purpose hoist solution for the extension of our existing facility; creating a 26-bed children’s home with ancillary facilities and an adjacent Hydrotherapy Pool. During the process, the team demonstrated a high level of professionalism, creativity and forward thinking. The project was pressured with funding constraints and timeline deadlines, the team went a long way to ease these pressures by being extremely responsive to our ever-changing needs while keeping the project to programme. An outstanding team of professionals who I would have no hesitation in recommending to any potential client. Teesside Hospice has been working with Innova for more than 5 years. In this time we have undertaken two major capital development programmes and have used them for equipment and furniture throughout. We have found them to be knowledgeable about Hospice care which has enabled them to advise us regarding appropriate furniture and equipment. They have always been responsive to our needs and have tailored furniture and equipment to our patient and organisational requirements. I would have no hesitation in recommending them to other organisations. 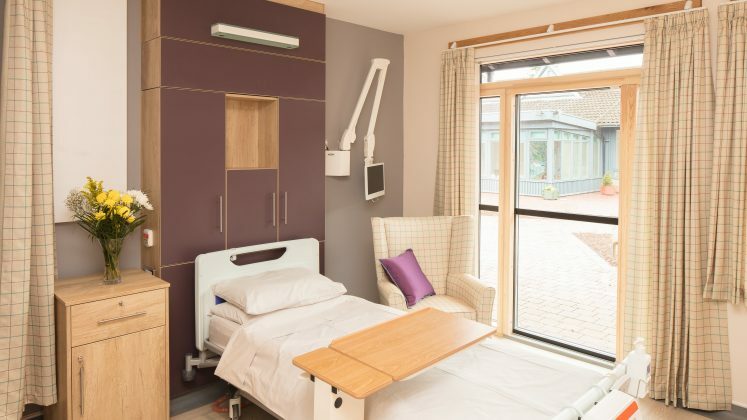 St Teresa’s Hospice has worked with Innova on 3 major refurbishment programmes over the past 10 years. The products have always been of a high standard and coupled with the company’s very friendly help and advice this makes Innova a pleasure to deal with. We first worked with Innova when they were recommended to us by a neighbouring Hospice. I would have no hesitation in recommending Innova to any other organisation as a company which provides high-quality products with very comprehensive and friendly support from the whole team. I had the opportunity to work with Innova on Oak Lodge School over the past few weeks and would like to express my appreciation for the excellent service that they have provided. As a Quantity Surveyor it is very key for me to have the needs to the client met by value for money services and to make sure the standards of Morgan Sindall Construction & Infrastructure Ltd are appreciated and subcontract negotiations and terms and conditions are understood and accepted. Innova has made this process stress-free and the professional services of Innova would lead me to use the company again for any specialist hoist services. From the outset, the initial presentation given to the end user was incredibly thorough and instilled confidence in the product. Your willingness to attend site meetings and discuss at length the various interfaces with your equipment ensured that the installation process was seamless. We found your installation team a pleasure to work with. The care taken to ensure we were happy with every detail didn’t go unnoticed. On behalf of the site team, I’d like to thank you for efforts in ensuring the success of this project and wish you all the best for the future. I have no doubt we’ll work together again. We contacted Innova after visiting several new build hospices to glean ideas for our development. We were told by others about their excellent service and after sales and following a tender/interview process chose to use Innova to provide furniture and clinical equipment for our £6.5 million redevelopment. We have found them to be helpful in selecting and procuring equipment for us, and any problems encountered they have responded promptly. We feel Innova understand our business and have offered us clear, sound advice on a range of their products. Quality of service coupled with quality products have resulted in us having no hesitation in recommending their company to industry colleagues.